Here's my video review of the Festool MFT system. I say 'system' because virtually all I cover in this review is applicable to the MFT/3 though it is the older discontinued MFT-1080. The review is in a playlist form so you can watch all the videos together or jump to a video that interests you more. Part 1: Overview of MFT system. The table, the rails, using the guide rail. Part 3: Qwas-ness. Uses of the Qwas dogs and rail dogs for angled cuts using the MFT guiderail or for doing wide square and repeatable cuts with a second guiderail. Someone considering using an MFT and TS in place of a table saw will likely get a few ideas from parts 2 and 3. I had problems seeing the video at first but it was something stupid on my end. I like how you did your fence. I did something different but the end results are the same. It's well worth the effort to get the extra cutting capacity. Very good review and you definitely understand the Qwas system and the use of stops. For those that are making the same cuts every day, you can make the stop fit over the Qwas Dogs by drilling a 13/16" hole. Paul, your MFT tips are very useful. When I built my shop the first two large machines to be installed, after the shop DC system was working, was a CNC nested router and a pressure beam saw. Those are both products sold by Stiles in the USA. A few days later Felder USA installed a large sliding table saw, a tilting arbor shaper, a joiner and a thickness planer. My expectation was that the beam saw would do virtually all the 90 degree cuts on sheet goods and that the slider would do all the non 90 degree cuts because its cross cut fence system is so accurate. While the beam saw is every bit as efficient and accurate as I expected, what I found from experience is that actually handling large pieces of sheet goods on the slider, as robust as it is, was not ideal. For over four years before building my shop I had broken down most of my sheet goods using Festool TS55 and guide rails as long as 3000mm. Generally I did that TS55 sawing on a sacrificial piece of plywood, drilling random holes when I needed to use Festool clamps and fastening wood guide stops as needed using drywall screws. Once I had the CNC router working, before we got so busy with customer orders, I wrote a program to drill 20mm holes on 96mm centers, like the MFT. The difference is that I did that on 4x10' 19mm Birch plywood. The permanent part of my work tables is welded from rectangular and square steel tubing, with poplar 19mm thick strips screwed from underneath to the tops of certain steel supports. The sacrificial top is held to the poplar strips with a little hot melt glue. That is enough to hold the top in place, and yet if my mistake the blade plunges overly deep, there is no risk of cutting a screw. By the time I concluded it was not efficient to use the slider saw for the odd angle sheet good pieces, we were using that same saw a whole lot making solid lumber face frames and other products. So, for the odd angle or beveled sheet good parts, we use the work tables as if they are over-sized MFT tables. We use both conventional and rail Qwas dogs. Faster than we could change settings on the slider saw, we can position a guide rail and appropriate stops to ensure we can repeat an angle to less than 0.015 degrees. With such large work tables we can keep big pieces of sheet goods balanced and still not need to lean over the table very far. One of our work tables has MFT/3 long extrusions running along both 10' sides. The welded steel of that table is different in that it is out to the edge of the plywood, still with a poplar strip on top, but of the appropriate size the Festool extrusion can bolt to it as if it were an MFT. Along those extrusions we can and do use the same Festool rail supports, except with a 75" guide rail. That arrangement is very effective when we need many shelves with beveled edges. One of our popular products are rolling media storage shelf units in which the shelves slope toward the back 7 degrees to keep stored media from falling off the shelves. We find it is faster to move the TS55 back and forth, set to a 7 degree bevel, than more the wood on the slider saw. Thanks for a great review Paul! I hadn't thought of using the layout of the holes like that. I'll definitely be ordering some bench dogs soon. Don't know if Qwas products are available in Europe but will check. Another most excellent video review, way to go Paul. It is hard to beat the endorsement of Mr. Qwas himself with respect to how to use the dogs. I just received my MFT so I don't have any Qwas dogs yet but hainv seen this they are definitely something I will be ordering soon. I especially like the rail dog setup for repeat cuts, it may not be as fast as a cabinet saw but it looks to be much more portable and versatile. So now you have to sign up to watch You-Tube videos? Is this new as of today? As a moderator I am wondering is this is a technical question. Did you have issues watching the videos? Paul: Awesome video and great advive on the use of the table and Qwas Dogs. I just ordered my super pack today and can't wait for them to get here. I am so looking forward to using the especially for sheet goods I need t cut for a cabinet I am making for a customer. I have watched a few of Paul's videos but this is the first I have tried requiring me to sign up or register. Just seems strange. Thanks for all the compliments, guys! I posted it before leaving to fix something at a cousin's house way in the boonies and came back to a lot of nice replies. As for the YouTube sign up, I don't know what's going on there for you. YouTube has 3 settings for videos: Private (while authoring; nobody but me can see it), Unlisted where you need a full URL (not the case with the playlist), and Public where everybody can see it or search for it. These are all marked Public as is the Playlist. So, you should be able to see them just fine. I tried from a different machine as a guest and it worked for me. Now, that said, if you went to my blog page and clicked on 'Subscribe' in the "YouTube Subscription" gadget, then yes you do need to sign up. But this is just to get notifications of when I post new stuff; for viewing, just use the playlist link I originally posted here. ccarrolladams: as for your "MFTs"
Actually, if you have a spare, I'd love to review one of those I have a friend here with a 5x10 CNC and one of these days, my other benchtop's MDF will get replaced with an oversized "MFT" top in HDF. Thanks for putting the time into these videos Paul... I have enjoyed them all. ..........Don't know if Qwas products are available in Europe but will check. They are not. Bob Marino is the US retailer and Dan Clermont in Canada, maybe one of them would be willing to ship to Europe. Or, you could could take Paul up on his offer. I whole heartedly agree! Paul, thank you! Well, if it were practical to send you a drilled 4x10' sheet by FedEx or UPS, I would do so. Actually I bought a 5'x12' CNC router mostly because that is the most popular size of sign plastic. One of our sidelines is routing for sign companies. Decades ago I started using plywood as my sacrificial surface. Although it is possible that MDF and HDF shrink less than does quality 19mm plywood, it is rare any given top will be in use more than 90 days. Or at least that is the case of the two work tables on which we do the bulk of our TS55 sawing. Three other 4'x10' drilled tables are used for assembly and/or hand sanding. I have considered using HDF instead, since these tables do not leave the shop. So far I have no source for HDF larger than 4'x8' I have had no problem retaining the accuracy of the holes during the useful life of a top. The plywood I use are sheets that were not considered attractive enough for use in a project. Instead of returning them to our plywood vendor we put them aside for eventual use building things for the shop, or making prototypes. When some time becomes available on the CNC machine, it takes seconds to call up the drilling routine. Almost always a 20mm drill bit is resident in the tool holder, since those are used for many purposes. Currently our CNC router is in use on 2 shifts 6 days a week. When I designed the shop I left vacant space for a second CNC router on the other side of the beam saw. Currently that space separates the sheet goods department from the face frame department. Great reviews Paul. . I see you are getting really good with your video editing as well. Love the overhead shots! Thanks for taking all the extra time to do all these. I've learned something new from every video. An added benefit is the weight loss. Paul, another excellent review. Your videos are educational, inspirational and fun. I like your sense of humor that comes thru in every video as also the great tips. Can you describe your video setup a bit what type of camera, lights, stands etc. Thanks, Vijay, for the compliments. Some pretty high-tech lighting... 75W bulb for reference... I tried a 150W halogen and it made next to no difference on the video... I think it's the wide-band light of an incandescent lamp that warms it up better. I have an el cheapo tripod, but it works well here. 72" tall when fully extended so the digital HD camera is on that; it's the main camera. I actually recorded this MFT one twice because I forgot about the DVC camera so I used my HD webcam that's in the shop. It works well, but you have to process the video quite a bit before you even get started with non-linear editing. It produces "oh about 22fps" and it's best for me to have 30fps DV to match the digital camera. So I need to convert the recording to 30fps DV first, which is an added step... though capturing from the DVC is straight realtime so 6 or half-a-dozen. Anyway, this is the mount for the Logitech 910C webcam. Nice camera. I used to stream from my shop all the time, but now it is pretty spotty. Editing is done on a 27" iMac with iMovie '11. The DVC imports by just playing it into the Firewire-400 port; digicam movie imports by popping in the SDHC card. Great series of videos. Thanks for putting them together and sharing them. I now understand the beauty of the MFT system - the precision-drilled holes (among the other more obvious features). I like your shop organization and decorations. The Band-Aids are a nice touch. Did you have a mishap with a SawStop? Really good series of videos. Thank you for making them. This makes me consider even more strongly giving up on the sliding table on my table saw. It seems I can never get that thing set up the way I want. Moreover, the cross cut capacity of the table saw's slider isn't always what I need. Somehow the MFT system relegates the table saw to the duty of only ripping. There have been plenty of times when I wanted to cut a long sliding dovetail but just didn't have the ability to do it with precision. As you mentioned, the MFT system lets that happen easily. Thanks again for the instructional videos. They are much appreciated. I don't have a MFT yet, but it is on my wish list. I can only imagine the "joy" when the first kerf Christens the MFT top. I am a little overwhelmed by what Festool to buy next since I need so much. A MFT/3 is near the top of the list however. I am a little overwhelmed by what Festool to buy next since I need so much. "A journey of a thousand miles begins with just one step." Following up on Paul-Marcel's review of the MFT system, I took it upon myself to create a calibration method similar to the one that Paul-Marcel did for the MFT 1080, but for the MFT/3. Note: width and length are rather immaterial; only thickness counts on this calibrator. 2. Using the Mini-square, verify that the cut-away end of the fence lines up with the right side of the miter gauge. This will provide 1 1/8” clear space between the end of the fence and the cut line in the MFT. 3. Loosen the fence clamp top knob releasing the fence. Loosen the miter gauge in/out motion adjustment knob. 4. Insert three Qwas Dogs in the second row of holes from the back of the MFT top. Lay in the MFT/3 Fence Calibrator between the fence and the Qwas Dogs. Hold the fence tightly against the Calibrator and the Qwas Dogs. Tighten the miter gauge in/out motion adjustment knob to lock it in place. While still holding the fence against the Calibrator, tighten the top knob of the fence clamp to ensure that there can be no movement of the fence. 5. Lay the two 1/2” (12 mm) Guide Rail Height Calibrators in place under the guide rail, then drop the guide rail into place and adjust the height of the guide rail down to meet the Height Calibrators. Now remove the Height Calibrators. 6. Once the guide rail height has been adjusted, place two Qwas Dogs in the 6th hole column (from the left) and in the 3rd and 7th holes from the back of the MFT/3. Insert the Guide Rail Calibrator between the Qwas Dogs and the side of the guide rail. The rail should be snug against the Guide Rail Calibrator. 7. Use the 12” x 8” reference square to validate that the guide rail is perpendicular to the fence. 8. With the fence now adjusted fully to the rear, the MFT/3 will accommodate material at a maximum width of 27 1/4”, more than the piece of ornately-figured and rare Georgian MDF shown in the photo. 9. The fence can be moved out to the third row of holes from the rear of the MFT/3 by using Qwas dogs to ensure proper alignment. As before, use the 12” x 8” reference square to validate the intersecting angle of the fence and guide rail. Note that there will be some play in the fence unless the fence clamp is moved to the left side of the MFT/3 and engaged to lock the fence into register. This setup will accommodate stock widths of up to 19 5/8” and brings the stock closer to the saw operator to reduce reaching. Note that the in/out adjustment of the miter gauge is almost at its maximum point. 10. If one is using conjoined MFT/3s, the placement of the fence clamp between the MFT/3s is not possible. If absolute squareness is required, place three Qwas Dogs behind the fence, loosen the miter gauge in/out adjustment knob, the slide the miter gauge back tightly against the Qwas Dogs and tighten the in/out adjustment knob. Leave the Qwas Dogs in place to ensure squareness. This position will allow a maximum material width of 20 1/2”. 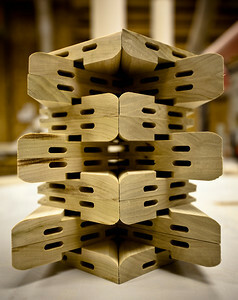 Moving the Qwas Dogs to the rearmost row of holes will allow a maximum material width of 24 5/16”. Note that to retain absolute squareness, one should leave the Qwas Dogs in place behind the fence, since the fence clamp can't be used in this position. 11. Moving the fence to the maximum extreme of the in/out adjustment will allow the fence to rotate up to 90 degrees clockwise, and up to 55 degrees counter-clockwise before the fence hits the rear guide rail pivot mount shown at the end of the pencil. This angle can be increased to 63 degrees by moving the fence to the left so that the fence guide pin is just inside the fence extrusion. Moving the fence 1/2” further to the left past the alignment pin will allow full 90 degrees of counter-clockwise rotation, and will give the fence a full 180 degrees of rotation. Note that when the fence is rotated, use of the fence clamp is advisable to retain best accuracy of cuts, but will necessitate breaking apart conjoined MFT/3s to accomplish this. 12. Note that if you cut your calibrators to a precise 24” length, and choose to apply measuring tape to the fence, you can use the 24” Calibrator length to validate that the 24” marker on the tape is at the exact point to get a good 24” cut at the guide rail. The Fence and Guide Rail Calibrators can also be used to set the height of the guide rail to 3/4” or 19 mm. Are the Qwas dogs on Bobs website, I could not find them? Or is there a special site to buy them? They're not available on Bob's site yet, but call him directly and he will set up the sale. Looks like a good working model Sparky. I don't have an MFT/3 so I can't verify any technical aspects but it looks right. I'm working with Paul-Marcel on something that might make this alignment easier. I notice step 9 and hope you showed this primarily to show how. I would find it much easier to just put my Qwas Dogs in the holes and then use the dogs as the fence rather than worry about moving and aligning the fence. This is my favorite use for the dogs since it saves you from reaching all the way across the table to make a cut on something small like 4-12" wide. Now the fence stays aligned for use with bigger workpieces and the dogs can be put in closer holes for smaller pieces. You nailed it. The idea was to show the capabilities for aligning the fence and rail to the MFT/3. Once the fence and rail are squared to the MFT/3, the possibilities are limitless. Thanks for producing them. Nice work and documentation, Willy. I don't have an MFT/3 either to follow up with trying it. I think the Woodcraft nearby has one they use for demos so maybe I could give it a looksy.